Learning DIY electronics can be challenging, but that doesn’t mean it can’t be fun too. The Piper Raspberry Pi Kit teaches you the essentials of computer engineering via Minecraft challenges, and is the most fun way to learn DIY electronics. It’s normally $300, but Kotaku readers can save over $50 plus free shipping today. Let’s face it - it’s much better to learn through fun, interactive, challenges than watching online tutorials. 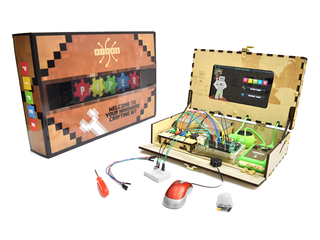 The Piper Kit puts this into action by teaching you the fundamentals of computer and electronics programming through hands-on Minecraft challenges. To progress in the game, you have to use the hardware components supplied with the kit, meaning you get to know how they work. These include LED lights, motion sensors, buzzers, buttons, and switches — all the essentials. The Piper Kit comes with the Raspberry Pi 2 Project Board, plus an LCD screen, breadboards, and all the hardware you’ll need. It normally runs for around $300, but right now, Kotaku readers can get one for just $239 with free shipping (18% off). You won’t find a better way to learn DIY electronics, or a better price on the web. Hit the link below to grab yours.